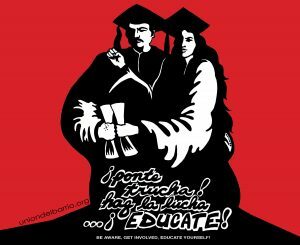 The work of Unión del Barrio that deals with K-12 Education and related issues involving “el Magisterio” will focus on the urgent issues that relate to budget cuts, the privatization of public education, the busting up of teachers unions, and reduced access to quality and relevant education for raza youth. We must build and maintain organized raza liberation struggle within every school campus were our numbers are significant, and our work should involve all sectors of the school community – parents, faculty, staff, etc. We must channel the energy and commitment of progressive educators in order to create the conditions necessary to support access to decolonizing and liberating education for our young people. Equally important to our work should be the defense of progressive educators from institutional repression that is inevitable when teachers decide to align their teaching to the interests of their students. Neighborhood schools should serve as a practical and ideological link to provide support and resources to local raza communities in struggle. This includes the building, support, and consolidation of independent “raza liberation schools” to prepare our youth to become subjects and authors of their own liberation. Raza liberation schools will serve the educational needs of our youth and our community in general, independent from the colonial and reactionary educational system as it is too often imposed on our communities. The education of our youth “…must be in the trenches of struggle with the community, with the students, with the workers… It must be in the service of the people. We believe it must be the science of the people… a liberating science. It must be a science that actually competes with and struggles against the sciences of the oppressor…” Excerpt from “Education, Chicano Studies, and Raza Liberation” by Ernesto Bustillos, 1992.